We are glass splashback specialists. 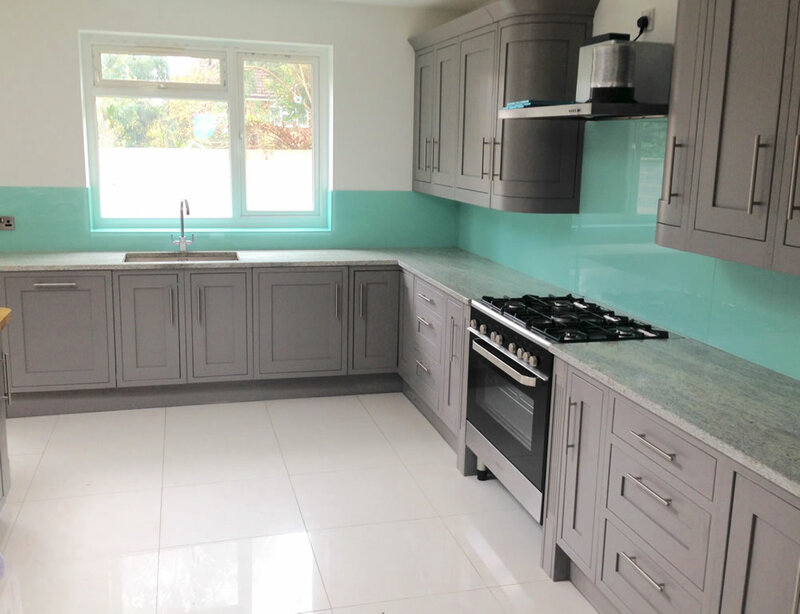 Family run with over 25 years in the industry, we supply homes & businesses with glass splashbacks throughout Kent, London, Surrey, Essex, East Sussex, West Sussex, Hertfordshire, Berkshire and all of the South East. 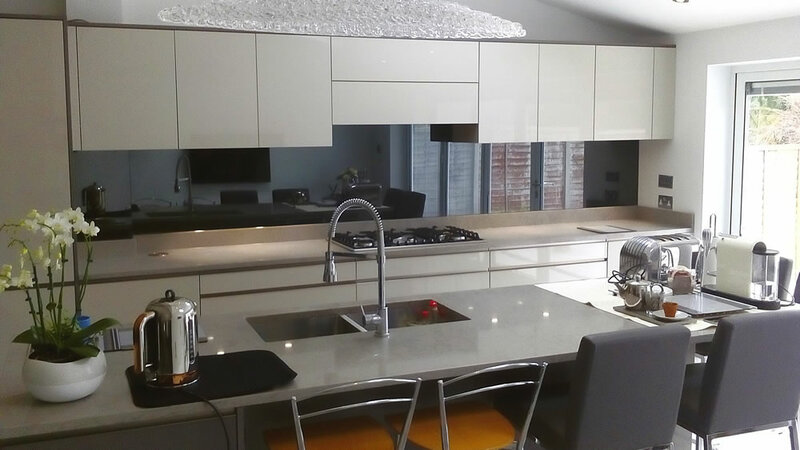 Experts on bespoke glass splashbacks and glass worktops, we offer a full ‘Design, Measure, Fit & Finish’ service. This ensures a hassle free process for our customers. 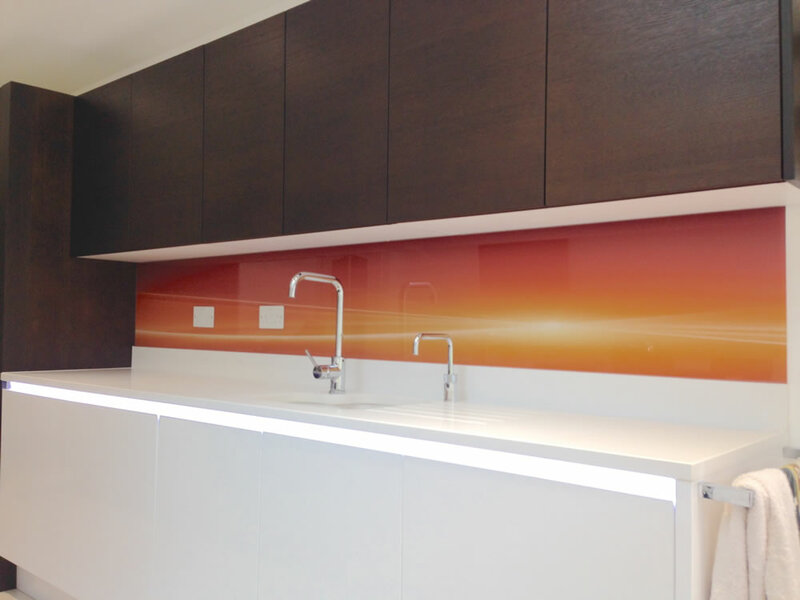 We measure and produce toughened glass splashbacks in any size, shape, colour and design. Options are limitless, but we can help you. Call us and ask about our Free Home Visit service. In the light of your home, we can show you colour samples, offer design advice, explain processes and work with you to achieve your desired look and finish. An exact fixed price for the works (no ‘rough ball park estimates’) can then be calculated for you there and then. No need for you to measure. No need to struggle with colour choice. No charge. Various appointment times are available, including evening and weekends. Contact us for information. 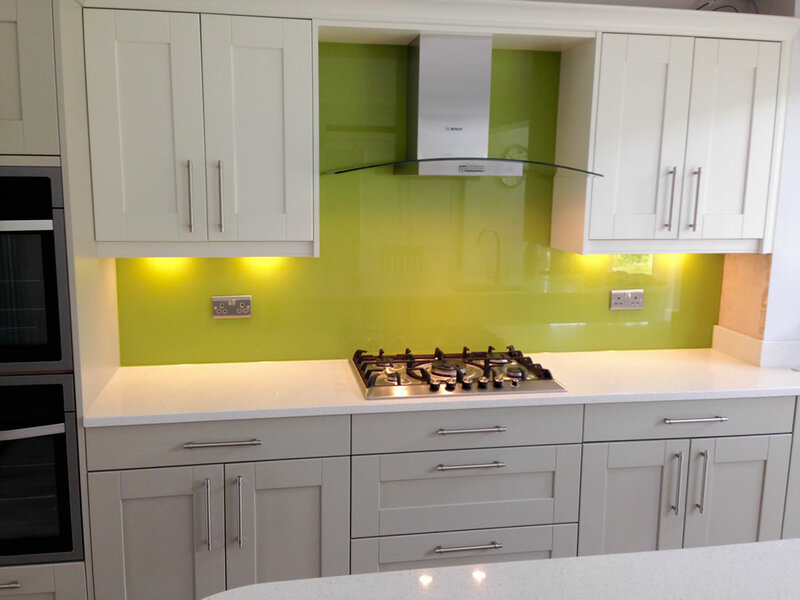 Coloured glass splashbacks in kitchens, bathrooms, shower rooms, wet rooms, W.C’s & utility rooms are popular for many reasons. Durable, heat resistant and brilliantly easy to clean, we can produce virtually any size, shape, colour or design. There are no grout lines that will harbour germs and discolour over time. Just a clean, smooth, wipe-able surface that will stay looking great and will not discolour. We provide a 10 year colour guarantee on all our glass splashbacks, covering against fading or peeling. We fit toughened glass splashbacks. Toughened glass is heat, scratch and impact resistant. This makes it ideal to be fitted near hot areas such as gas hobs, and in busy kitchens where the walls may get bumped & bashed. Virtually any shade of any colour is possible to produce. We can show you an extensive selection of colours and samples for you to gain inspiration and choose from. We also provide free colour matching if you have already identified your own colour. We can match to RAL, Pantone, Dulux, Valspar, Farrow & Ball and pretty much any paint range. We can even match to coloured objects. Measuring and/or fitting glass splashbacks yourself can be problematic, stressful and will often result in a poor quality fit, or expensive mistakes. And silicone work is a sticky business. Our comprehensive ‘Design, Measure, Fit & Finish’ service removes that worry and stress, and ensures a neat & tidy result. We measure and cut out around plugs, electrical points, taps and can shape around virtually anything, including extractor hoods above cookers. And once your new glass splashbacks are ready, we return and complete the fitting. Contact us to discuss your requirements. Or if your splashback needs to be just square or rectangular, without any cutouts or shaping, our ‘Assisted DIY’ service will be best for you. You supply your measurements, but we will deliver and fit for free. You can order this option via our DIY Shop section here on our website. 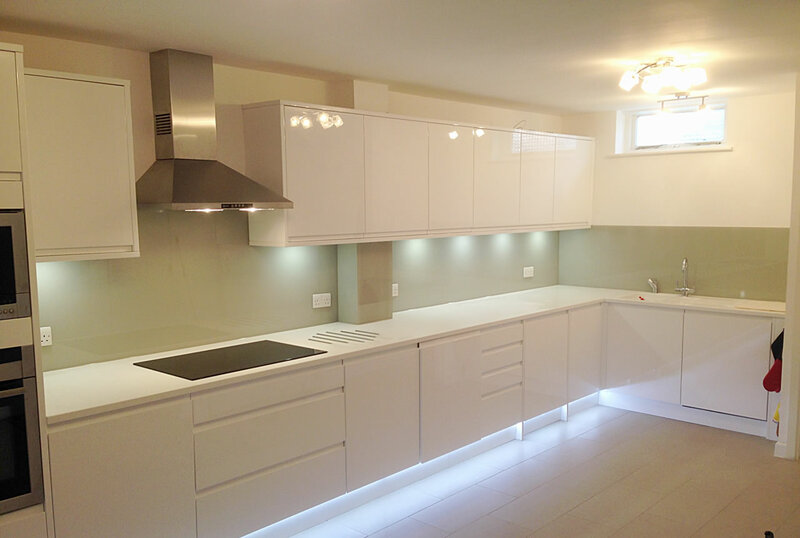 All of our glass splashbacks are made to measure for you and your home. Extra long splashback panels achieve long runs of seamless, uninterrupted glass without joins. We can produce longer than most companies, and are experienced in doing so. Talk to us and we’ll tell you what’s possible.